The whole time we were at Disneyworld, I kept calling Hollywood Studios "MGM." I wasn't sure why, except that maybe I associated Hollywood with the big movie studios? The charges would roll their eyes and correct me everytime. "Moooooooom!" Kids always drag out the vowels when they are exasperated, don't they? I stubbornly insisted on calling it MGM. (Read: Once I get the wrong idea in my mind, it's stuck there for eternity. So let it be written, so let it be done.) The Quiet Man suprised me with a copy of the Disneyworld cookbook last week. 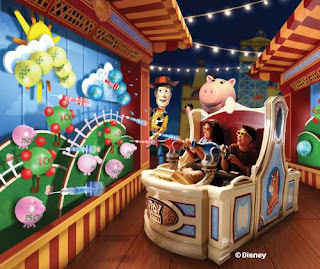 It's full of recipes from all around the park-including MGM! Read that again: M.G.M, baby! Not Hollywood Studios, my adolescent aborrigines, but MGM! At least there is a method to my madness. Apparently it is out of vogue to call it MGM now, but once upon a time, whenever this cookbook was published, the place was called MGM. Disney might be able to change names, but I'm keeping to the original. That's my story and I'm sticking to it. So...while we were at MGM (not Hollywood)...we rode the Tower of Terror (scream for me) and the Great Movie Ride and Toy Story Mania. West built his own lightsaber to become an official Jedi Knight of the highest order. 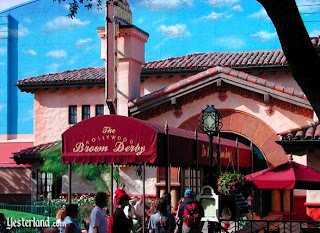 And we ate the famous Cobb Salad at the Brown Derby. (William Holden wasn't there, in case any I love Lucy fans were wondering.) There's a reason this salad is so famous. It's superb. 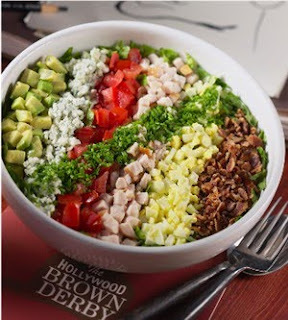 This is the original Cobb salad that has spawned so many variations and imitations. The original is the best. The dressing is fantastic and the recipe below makes a hefty batch. It's a little taste of MGM (that's right, MGM-ya wanna make something of it?) all the way from Hollywood Studios. Chop all greens very fine (reserve some watercress for presentation) and arrange in salad bowl. Cut tomatoes in half, remove seeds and dice une. Also dice the turkey, avocado and eggs. Arrange the above ingredients, as well as the blue cheese and bacon crumbles, in straight lines across the greens. Arrange the chives diagonally across the above lines. Present the salad at the table, then toss with the dressing (below) and place on chilled plates with a watercress garnish. Serves six. Blend together all ingredients, except oils, then add olive and salad oils and mix well. Blend well again before mixing with salad. This makes a big batch; store in the fridge and use within 3 weeks. I used to work there when it was called MGM Studios. I brought my three little ones there last December and couldn't stop calling it MGM, either. 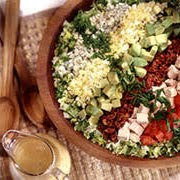 Cobb Salad is one of my favorites. This recipe looks amazing and your pictures and story are cute. That's a really nice looking salad! Your trip looks WONDERFUL! How lucky! I have been reading along and cannot believe how many rollercoastery rides you rode. That surprised me. I thought we were two chickens together. That was nice of you to ride with your children. I would have called Hollywood Studios MGM, too. For some reason it reminded me of Lucy. Lucy at Grauman's Chinese theater. Did you try and steal John Wayne's footprints? That was nice of The Quiet Man to get you the cookbook. Tangi's comment made me laugh, by the way. MGM and Enrichment Night. Pretty funny. Really? Cobb salad is supposed to have French dressing? I thought it was blue cheese, although I'll admit I like it better with a buttermilk ranch or honey mustard. I guess I'll have to try it if you say it's good.